The clouds tumbled down the lush green mountains as the first rays of light streaked through the dense skies. I stirred from my early morning stupor as the car lurched precariously along another curve. Beside me the soon-to-be chef slept like a log. On the other side, my soon-to-be wife, slept with her hair in tussles, beautiful and with a confident calmness about her. The beautiful landscape that rolled by at great speed was just a precursor to what we would see over the next 4 days. We hardly expected what came our way, but in the end we were happy about it. 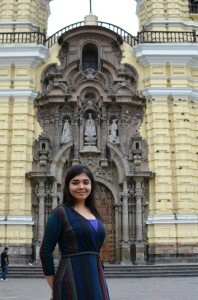 We arrived in Lima on Friday and on Saturday we were on our way to Cusco. Lima was like any other city – crowded, noisy, polluted. One thing that struck me about Lima was the similarities it shared with several Indian cities. I guess countries and cities with similar economic statures have a lot in common. We had a sumptuous lunch at Larcomar and visited the catacombs under the San Francisco Church. We were already brimming with excitement about going to Cusco and then onto the Inca Trail. We called it an early evening as we had our flight next morning to Cusco. Cusco, by the looks of it looks like a sleepy little town resting in a valley, unsure of itself and cowering under the fear of the surrounding mountains. However, once you step on its soil, the rich history of the Incas, the strength of their feet and the enterprise of the modern day backpacker gets your adrenaline pumping. It is situated at an altitude of 3,300 m. When you fly in to Cusco you are advised to not exert yourself since you fly from sea-level and land at that altitude. We decided to go straight to our hotel and try to rest for a few hours before heading out. Anywhere you go in Cusco you will be offered cocoa tea. It shares the same stimulants as Cocaine but in extremely small quantities. It is helpful to get your blood circulation faster at those high altitudes and it gives you stamina. Like clockwork, we were offered cocoa tea as we stepped into the cool shade of Hotel Rumi Punku. We decided to start off with some great food which is authentic and delicious. The hotel recommended Papa Pacha and we headed straight there after dropping our luggage. Lunch was terrific and we decided to walk back to the hotel instead of taking the cab. We slept through the afternoon to get accustomed to the altitude. It was evening when we woke up and we decided to stroll through the streets of Cusco. They were vibrant with colors, lights, tourists and llamas. Small bars and cafes dotted Choquechaca as we walked along to reach the Plaza de Armas. There were people walking about, shopping, conversing and the lights of the city jostled for attention as the sun went down. Evenings in Cusco are beautiful. The city has been settled in waves over an uneven terrain. There are places where the land rises in one big heave and overlooks the little lights below as if they are far away on the horizon. On the streets, stray dogs whimper sleepily, unaware of the dust of history they breathe. Men and women in traditional clothes lumber about bringing an end to another day. Backpackers drink in the little bars and cafes around Plaza de Armas creating dreams of their upcoming journeys. And the mercury lamps around us cast long shadows on the ancient lanes where the Incas once walked. After dinner, we walked in silence, out of respect and awe at the magnificence of the small town. I knew I had found the perfect mate to spend these beautiful evenings in foreign lands. And I would do it again and again and again as I did in Costa Rica, Granada (Nicaragua) and Red Lodge, Burlington, Bishop (USA). 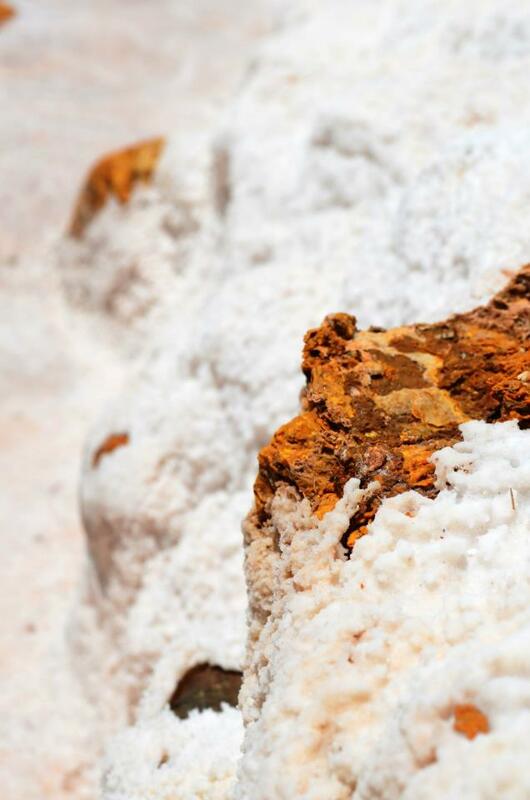 On Sunday we went to Moray and Maras Salt mines. It was fascinating to see the laboratory of Incas where they cultivated various qualities of seeds. Moray was located centrally during the time of the Incas and that made it easy to dispatch the seeds to the four corners of their empire. The step cultivation technique developed by the Incas ensured micro-climates at each level and made it possible to develop various kinds of seeds in the same location. The Maras salt mines were also fascinating with the salt almost looking like snow from a distance. The bus ride down to the mines was a little scary with the road being too narrow and without any crash barriers – but we were used to such rides back in India. After we returned to Cusco we had lunch in a little french cafe. In the evening we decided to look for an Indian restaurant and to our surprise there was one in Cusco! In fact it was quite close to our hotel. It was called Korma Sutra and was unsurprisingly run by a British chef. On Monday we went shopping for trinkets and spent some spa time. 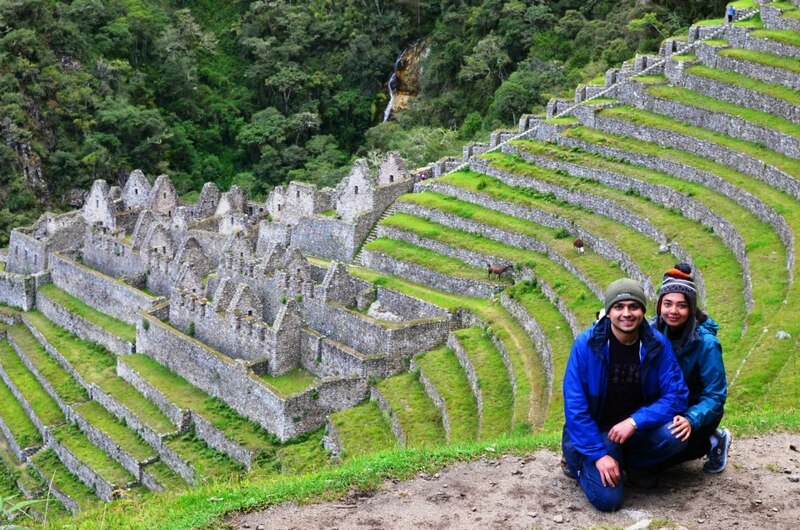 that evening was the last one in Cusco before we left on the trip of a lifetime – the Inca trail. We decided to finish up with another meal in Pacha Papa. Peru in November is damp with impending rain and truncated showers every afternoon. The sun burns through your skin as quickly as the rain drenches you. The weather was in cohorts with the terrain – as whimsical as the heaving mountains in the ‘Sacred Valley’. 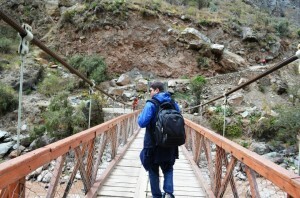 We had decided to trek through the Sacred Valley along the Inca Trail months ago. With very little preparation and trepidation we were on our way early Tuesday morning at 4:00 am. 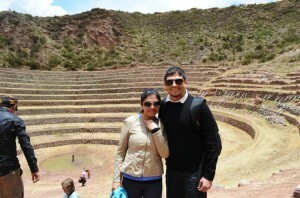 The first stop on the way to the trail-head was Ollantaytambo. We stopped there for breakfast. It was a small place that consisted of probably just a town square where all business was transacted. It was the place where all the groups start for the trek to Machu Picchu. This is the place where you find porters who will help carry the food and equipment during this trek. We got slightly delayed in finding porters for our trip since it was only the two of us and porters get picked up pretty fast by the large groups. While our chef was sorting this out, our guide Lourdes took us on a little jaunt around the town showing us some of the astronomy related beliefs of the Incas and how they thought that Sun was one of the most important elements of nature. Once we found our porters, we were on our way to Km. 82 which is the beginning of the trail. We got our permits and our passports stamped at the trail-head and off we were to begin the grueling 4 day-3 night trek. 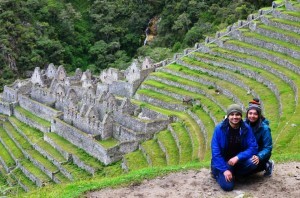 Machu Picchu is now one of the new seven wonders of the world and this started a great influx of tourists here. A few years ago the Govt. 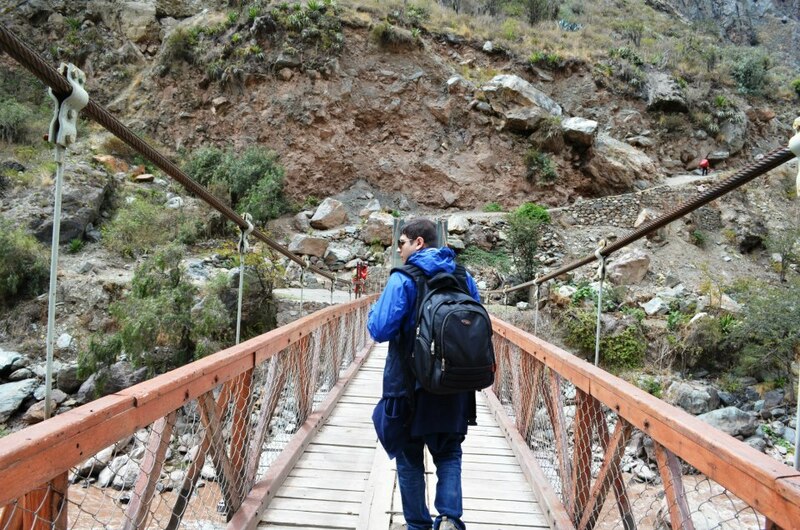 of Peru decided to impose restrictions on the number of people that can use the Inca Trail every day. This limit was set to 500 and because of this one needs to plan the trek a few months in advance. The Inca Trail is ecologically fragile and needs to be well preserved. The trek until half-way to Wayallabamba was pleasant and almost like a walk. Besides we were well rested and all pumped up to do the trek. As we started nearing Wayallabamba we realized the gravity of the situation we were in. This was not going to be easy. This was not a trek for complete beginners and definitely not for the unfit. We had a problem. We made our way to Wayallabamba with several stops in between. We were made to pull out our ponchos on day 1 itself with rain playing spoilsport. Our porters were of course waiting for us when we reached the lunch site with hot lunch and appetizers ready for us. We wondered how they do it. We ate in silence, each contemplating whether we will be able to make it through 3 more days of this. After lunch we started ascending steeper slopes and we got ourselves tired pretty quickly. Lourdes gave us an option to change our camp location for the night which would mean we would have to trek a little bit more the next day. Neha reminded me once again why I loved her by quickly rejecting it saying that we will go all the way. It turned out to be an excellent decision and I loved the fact that she was so brave. 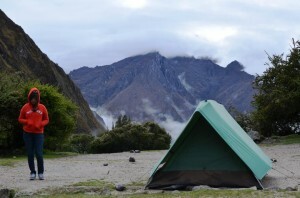 We reached our campsite at Lluchapampa after 10 hours of trekking from 2,350 m to 3,700 m. They had setup two tents. One large tent for the porters and the guide and another small two person tent for Neha and I. Dinner was in the large tent and we were completely broken when we went in. I could barely keep my legs from shivering due to the fatigue – I couldnt imagine what Neha must be feeling like. It was cold outside and sleep came in fits. We woke up to one of the most breathtaking views from our tents. Snow capped peaks standing majestically in the sacred valley along the Urubamba river. It was hard to find words for the visual and we couldnt believe we slept with one of the most beautiful views right in front of us. Wednesday was probably the worst trekking day in the trip. We had to climb two passes. As we started from Lluchapampa we climbed up steep slopes to reach Warmiwanusca or the Dead woman’s pass at 4,200 m. This was the highest point of the trek. We had a feeling of exhilaration as we reached the summit. It had rained almost all through the way and the path down was full of boulders and steps. This meant high chances of slipping unless…. you sprinted down. That is what I did and I was lucky enough to be unhurt. I chatted up some Australians along the way down. There were hardly any Indians among all the people we saw on the trek. As we descended from 4,200 m to 3,300 m our knees gave away. By the time we reached the lunch site I couldn’t feel my thighs anymore. But we still had a long way to go. There was yet another pass left to be conquered. Along the way we stopped at the ruins of Runkuracay which were probably built as either an astronomy site since it provided an unhindered view of the Pacamayo valley or as a lodging house for the Inca runners. The story goes that the Incas used to deliver messages from Machu Picchu to other parts of the sacred valley by running along the Inca trail. We could barely even walk. Tired and dejected we reached Chaquicocha right around dinner time when all others were already there and camped. With great difficulty we lay ourselves down and had our dinner. With this night the toughest part of the trip was over. On Thursday it was mostly a walk through a sub-tropical forest to reach Phuyupatamarca and from then on it was a steep descent into Winaywayna. It was a short day as we reached Winaywayna by late afternoon and that was our campsite! It was one of the best feelings to not have trekked for 10 hours that day. Winaywayna was a nice precursor to what was to come in Machu Picchu. It was a beautiful little township with temples and ancient showers and proper sanitation carved out of rocks. It was a stunning creation carved out of a hillside and you would wonder how they lived and if this is all they did their whole lives. Wouldn’t their lives still be immensely more constructive than ours? The afternoon was relaxing as we toyed with the camera and looked at our images from the past few days. We still wondered whether it was a good idea to have done this trek. We slept early as we were instructed to wake up and leave at 5:00 am from the camp site in order to avoid the crowds at the check-in point of Machu Picchu. We began the slow and sleepy walk to the Winaywayna check-point where they would look at our permits one last time before letting us go on to Machu Picchu. It was a long wait before they opened the counters and by 6:30 am we were on our way to Intipunku. 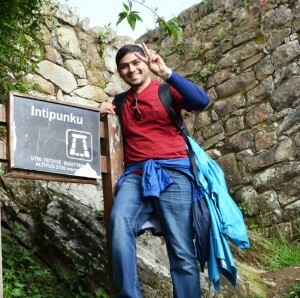 it was the last steep climb of the trek until we reached Intipunku. 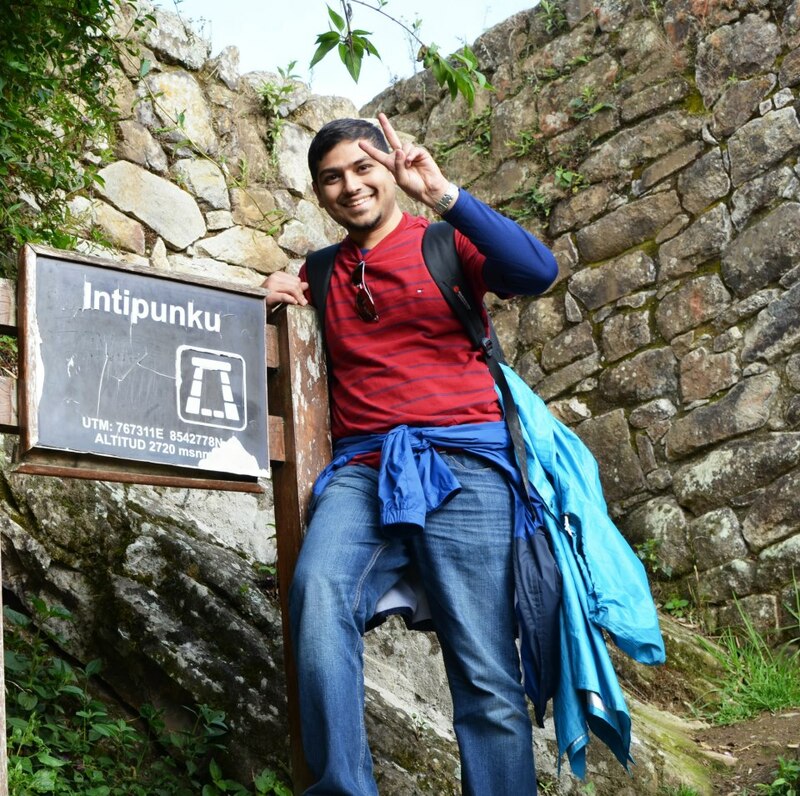 Intipunku or the Sun gate is the place from where the first rays of sunlight fall upon the sun temple which has been built in Macchu Pichu. The anguish we felt through the last three days, the pain and suffering of the trek, the tiredness of not having slept well for three nights were all gone as we reached Intipunku. 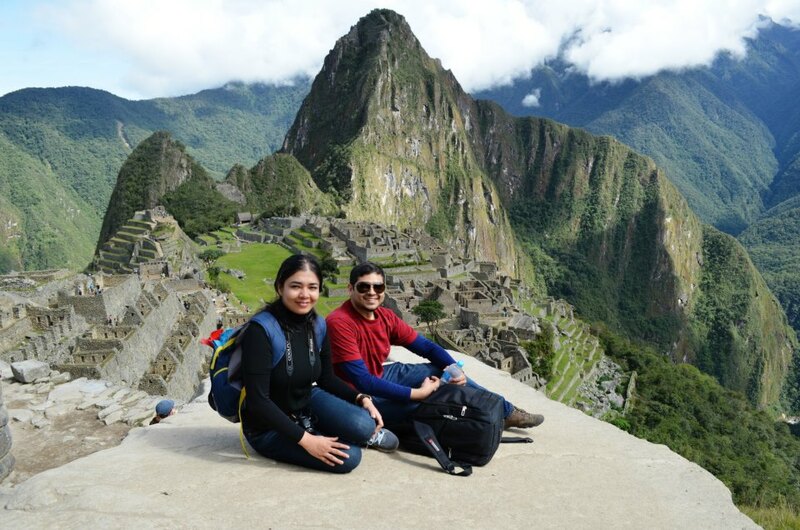 It gives you an immense sense of achievement and the first glimpse of Machu Picchu from beyond the sun gate is a feeling that cannot be described in words. As we waited there, other trekkers poured in and amid shouts of joy and tears of happiness we hugged each other and realized that we achieved something big. Something that not many people from our country are able to do. It was our first success story together – one of many to come. It was the start of a new life and the beginning of an era. In an instant this trip became the trip of our lifetime and something that we will talk about for years to come. 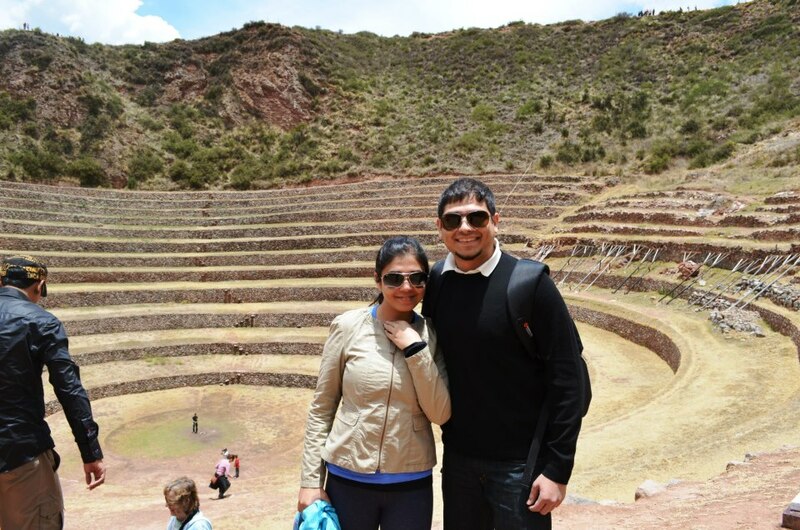 As we approached Machu Picchu, we saw travelers who were in impeccable clothes, clean shaven and smelling nice. 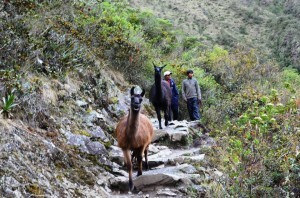 We realized that these were the ones who came in the hordes that come by train to Machu Picchu. We almost sneered at them thinking what kind of losers would take the train and miss so many great memories and a beautiful journey. After spending a couple of hours marveling at the history and architecture of Machu Picchu we bid our goodbyes to the sacred valley and took a bus down to the town of Aguas Calientes (Hot Water). We were finally back to the real world, the world of trains and buses and cars and airplanes. Aguas Calientes is a railway town. It is built solely to cater to the needs of the travelers that pour in by the trains and who are returning after completing the Inca trail. The town has a character that not many towns have. Several restaurants built along the river and on both sides of the railway tracks. The food here is inspired by the pop-cuisine of America and the bastardized version of Latin American food. Our train was in the evening and we spent several hours here, eating and drinking, observing backpackers and filling in their back-stories with colors of our own. 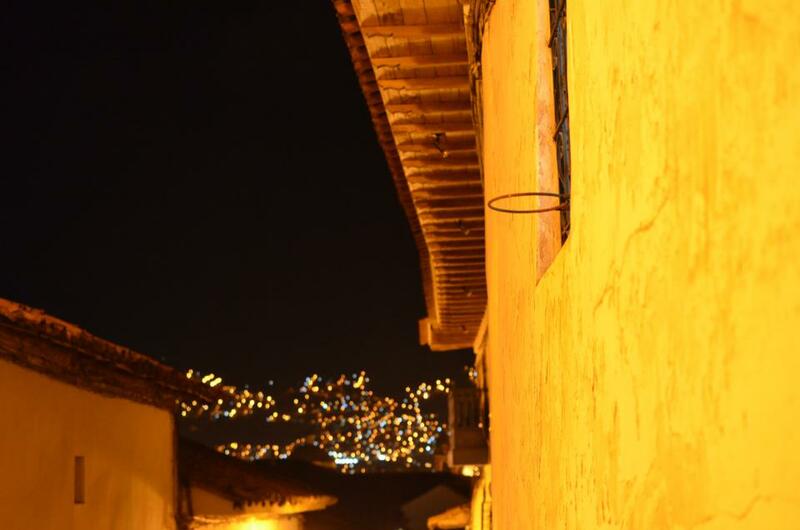 We knew it was time to go back to Cusco one last time and marvel at the cusquenian evening. Our Peruvian adventure had ended. It was a perfect end to our travels before we got married in December.